During the late Georgian period in England, formal dining rooms were furnished with long side tables used for serving. The need for storage space occasioned a transition from the simple side table or "side" board to a form which also had drawers and cupboards used to store silver holloware an d other serving items used at dinner. The first "side" boards in America were made in the Federal period, when the formal dining room became more common in our American homes. Southern custom more closely echoed the English traditions, and the sideboard was known in the Middle Atlantic and Southern states as early as 1785. As a result, the serving pieces used at hunt breakfasts and other such occasions were transitional in form, similar to English examples. They were usually tall, for comfortable serving, and often incorporated drawer space for storage. These early Federal serving pieces were known as "hunt" boards. Our American Federal ClassicsTM replica huntboard is an exact copy of a rare original Maryland huntboard, made circa 1795. It has tall, stately proportions with an ideal serving height. 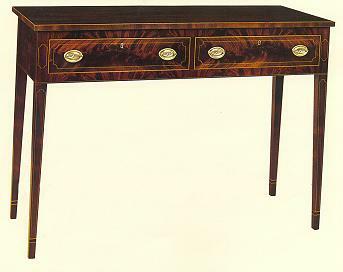 The top and legs are ornamented with light wood string inlay on the front. The case and drawers have mortise and tenon and dovetail construction, exactly like the original example. The hand rubbed shellac finish highlights the beautiful natural grain and color of the select South American mahogany used in this exquisite piece.